After regaling a non-rider with my first long distance ride experience (1993), I thought I’d put it on here as well. I had owned and ridden a motorcycle for less than two years but that didn’t mean that I knew what I was doing. I had put on very few miles in those years, and had switched bikes midway through, so I never had to pay attention to silly things like chains or tire wear. In fact, my second bike had a belt drive that allowed me to continue on oblivious to chain maintenance. I just rode the bike from point A to point B and that was that. It was essentially a two-wheeled car and nothing more. So when I found myself without transportation for my summer job in the mountains of Colorado, for some reason I thought: I should have a motorcycle here! I found one very cheap at the dealership. 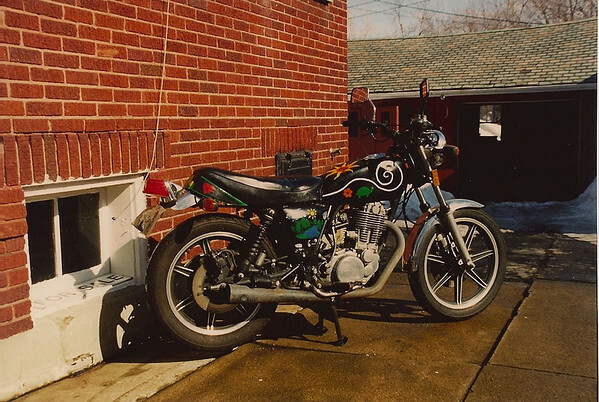 It was a 1976 Yamaha SR500. It was black. It was $700. And that’s all I knew about it. I had my parents ship out my gear and I proceeded to ride it from my workplace near Estes Park to Boulder once a week. No, I didn’t take advantage of being in the backyard of some of the most spectacular riding in the country. That never occurred to me. Instead, it was again just one way of getting into town and back. Then the end of my summer job loomed. The original plan was to sell the bike at the end of the summer and take Amtrak back home. But I didn’t have a phone number where I was staying; how can you sell something without a phone number for people to reach you? And I was staying at some backwater dude ranch – not exactly a high-traffic area for people to happen upon the bike. Oddly enough, it never occurred to me to take the bike back to the dealer. Instead I came up with the brilliant idea to ride the bike home. Fifteen hundred miles across some of the flattest and hottest roads with no long-distance riding experience whatsoever. Sounded like a good plan to me. In fact, Tom Cochrane’s song “Life is a Highway” came on the radio as I was making my decision and I took it as a sign: Ride Home! What follows is the most amazing collection of nativity and luck, and I’m rather embarrassed to share it. But a rider has to start somewhere, and this was my start. It was Sunday, August 28th when I left the dude ranch. I had a small backpack with my overnight stuff, having shipped everything else home. It was just me, my bike and the open road. I headed east, down out of the mountains, past Boulder and through Denver. Good bye, Stapleton Airport! I had spent every Sunday that summer dropping guests off and picking up new ones at that airport, and now I was going to leave that chapter behind me. Or so I thought. The big city was 40 miles behind me and there was nothing but hot, dry scrublands before me. The bike sputtered. I looked down at the controls in alarm and instinctively pulled in the clutch. I vaguely noticed that the clutch cable was frayed. The engine died. I coasted to a stop on the shoulder and sat there. The clutch cable was broken. In my mind, eager to find a solution as to why the engine died, I assigned the broken clutch cable blame. Yes, I know now that it makes no sense, but that’s what I came up with: I needed a new clutch cable. I got off the bike and put out my thumb. Mere minutes later a car pulled over and offered me a ride to the next exit, which was just out of sight a mile away. Perfect. The exit had two gas stations and nothing else. I walked over to the first gas station and asked if there was someone in the area who worked on motorcycles. The lady behind the counter suggested that I go to Denver. Um, thanks. I walked over to the second gas station. Same question, same answer. Sigh. So I walked back up to the highway, the sun beating down on my black leathers, and I put out my thumb in the direction of Denver. Again, it didn’t take long before someone stopped: a trucker who told me that his buddy had radioed back that I was there. I climbed up into the cab and we agreed that he’d take me to a truck stop that was situated across the highway from the airport. I could hardly ask for anything better. I pointed out my bike to the trucker as we passed it, sitting forlornly along the side of the road, my backpack bungeed to the back of the seat. It didn’t take us long to reach the truck stop and I thanked the driver. I then crossed the busy road to reach the airport. I had a plan. The roommate was fine with it and I made myself at home while they madly cleaned and packed up their apartment. The semester was over and they were heading home. I gave them some suggestions on defrosting the freezer but generally stayed out of their way until I was too tired to stay awake any longer. I mentioned that I was going to go to sleep but the ice-chipping roommate seemed concerned that I was sleeping in the living room, in the midst of the hubbub of cleaning and packing. Of pure heart, he offered me his bed, saying that he would just take the couch when he was finally ready. The waterbed was much more comfortable than the couch and I took it with little hesitation. Sadly, despite his generosity, I can’t remember his name, for which I feel very bad. The next morning I walked over to the motorcycle shop, not realizing until years later that most motorcycle dealerships are closed Sundays AND Mondays, and how lucky I was that this one was open on this sunny Monday morning. I bought a clutch cable for my bike and then I asked how much they would charge to take me back to my bike, hopefully still sitting on the side of the road, and install it. The service guy wasn’t sure of the exact charge, but he did know that it would be $70 just to get me to my bike. The fingers clenched reflexively at the thought of spending more money. I declined and left the shop, not quite sure what my alternative would be. I found my roommate still at his apartment and casually mentioned my situation. Much to my surprise he mentioned that he’d be leaving for Connecticut later that afternoon and if I didn’t mind waiting around, he’d take me to my bike on his way out of town. Wow! Another piece of the puzzle falls into my lap. I readily agreed and wandered to the park to read while he ran errands. When the time came we jumped into his car and headed east. Once again I passed through Denver and greeted the dry desert beyond. Forty miles later we saw my bike, waiting patiently for me right where I left it, backpack included. As the car pulled in behind the bike my roommate casually asked if I had the tools I needed. Um, tools? No. I didn’t have any tools. Not even a screwdriver. For the first time I really began to understand how blindly I was going about this whole situation. Fortunately he had some tools in his car and not only dragged them out, but also proceeded to replace the cable – something I had no idea how to do myself. The clutch cable installed, I thanked my savior profusely and proceeded to gear up and get on the bike. With no fanfare, the bike started right up and I waved as I pulled onto the highway, leaving my roommate to put his tools away. I was on the road again! It was another beautiful day and I felt that I had been very clever in solving my problems. Then bike sputtered and died. I coasted to the side of the road again, this time at the top of the exit I had hitched to the previous day. The light bulb was brilliant in my head as I sat there on the bike: I was out of gas. That was also what had caused the bike to die yesterday; the clutch cable was just a decoy. As I came to this realization, my roommate pulled up behind me to find out what the situation was. I explained that I now believed that I was merely out of gas. I asked him if he would stick around to make sure that was all it was and he agreed. I managed to get the bike down to one of the stations and fill it up. Then we were back on the road: me on my single cylinder 500 and he in his little cheap sports car, driving along the flat expanses of eastern Colorado. Seventy miles later I stopped again. Apparently this bike had a very small gas tank. My roommate stopped as well, ensuring that it was only a matter of refueling to get me back on the road. This scenario repeated itself one more time until we reached the Kansas border. At this point the sun was dipping lower in the sky and I was confident that the bike would continue to run well, albeit with frequent gas stops. I suggested that we stop for dinner and then released my roommate from his babysitting obligation. The relief on his face was visible, certainly tired of my slow speed and our lack of progress. I thanked him again, and to this day I wish that I knew who he was and had some way of repaying him. I apparently got a motel that night, although I don’t recall the details of it. The next day was another long, rather dull day on I-70. I recall seeing a buffalo somewhere, and some sunflowers. Other than that there was little that stood out in my mind from this section of road. I do recall the next night, however. St Louis was on the horizon to the east and the sun was falling behind the horizon to the west. It was time to stop again for the night. With my extreme lack of traveling experience, I figured that the further into the city I went, the more likely I would be to find a place to stay. I was wrong. The city skyscrapers gathered around me as I navigated the streets under the full moon. I stopped at the first hotel I found and went in to ask the rates. He quoted me a number that left me dismayed. There was no way I was going to pay $60 for a room! I then asked him if there was another motel he could suggest, something a little less fancy. He hesitated and glanced at his co-worker. There was a motel a couple of blocks away, but it was in a bad area and wasn’t very clean or nice. He asked me to wait a moment and disappeared through a doorway. He came back a moment later and offered me the room for $40. I was exhausted. I smiled gratefully and took it. I dragged my backpack into the elevator and went up to the 9th floor, throwing myself onto the bed and falling asleep. The next morning I woke up refreshed and threw open the curtains. Much to my pleasure, I saw that I had an excellent view of the St Louis Arch! I appreciated all the more the rate I had been given and the surprise that greeted me that morning. It was another uneventful ride that day. I was headed for Cincinnati to stay with my sister. We had a good visit and while I was there a neighbor of hers commented on my chain. Chain? I knew nothing of chains. I didn’t know that they needed adjustment or even lubrication. He pointed out how slack it was and offered to put a new one on for me. I agreed and he did it that afternoon while I spent the time with my sister. The next morning the bike was ready to go and so was I. Next on the trip was my other sister’s house, near Frazeysburg, OH. Time passed uneventfully as I cruised through the lush and rolling hills. I reached Frazeysburg in good time and headed for the lone grocery store in this one-traffic light town. That’s when I looked down and saw oil spewing forth from somewhere near my left foot. What!?! I pulled in the clutch, cut the engine and coasted to the side. Oil drained out of the bike from the footpeg area. I had no idea what had happened. The parking lot was mere yards away so I pushed the bike under the shade of a tree and called my sister. She lived a good 10 minutes outside of this small burg and I wasn’t sure what to do. She came and got me and made arrangements to have her husband pick up the bike later and bring it to their house. Once I was able to inspect the bike under more relaxed conditions it appeared that a bolt was missing from when the chain had been replaced. That’s my guess, anyway, as I didn’t know what to really look for and I was grasping at straws. But there was no hope in fixing it any time soon, as it was now Friday afternoon on Labor Day weekend. Nothing would be open for days. I’d leave the bike and fix it later. I was only four hours from home so it wasn’t an unreasonable expectation. My sister and her husband were going to an event midway between our houses and I made arrangements for my boyfriend to pick me up at the event. A month or so later I hitched a ride with my Grandpa to go back and get the bike, bolt and jugs of oil in hand. The bolt fit, the oil was poured in and without any fuss, I rode it home. Sometime later I sold the bike. I had already moved from my parents’ house and it needed to be gone. I think I my parents put it out with a yard sale they were having. I have no idea who bought it or whatever happened to it. It took a few more years of riding before I realized just how much I didn’t know. I still don’t know it all, but I think that I’ve come a long way since that hot, August day in 1993.